If steel wool (fig. 1) is burnt, the high exothermic heat generation (the general basis of oxidation) causes the oxygen atoms in the air to merge into a new atomic bond. 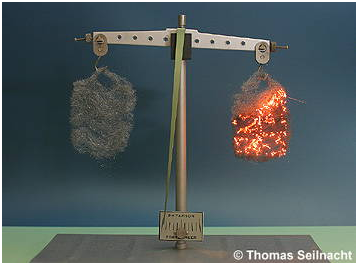 As the product of the reaction (FeO) now contains new bound O2 atoms, the weight of the steel wool increases during burning. It is also referred to as oxidation if the oxygen content in an oxide is increased (e.g. the oxidation of Cu2O to CuO).